The opposition has named this Friday: “Your Silence is Killing US” in reference to the silent majority in the cities of Damascus and Aleppo who have yet to join the demonstrations. The three sacred cows of the Syrian regime are the army, Damascus and Aleppo. So long as they remain united and on the side of the regime or silent, the revolution will have a very difficult time overturning the political order. In talking to friends in Syria, I am told that the mukhabarat are playing an ever larger role in the suppression of the opposition, as military responses prove ineffective. Particularly in Damascus and Aleppo they are thick on the ground in an effort to keep Syria’s two principal cities from becoming battle grounds and going the way of Hama or Homs. Correction: in my last post, I highlighted a video of Imam Buti being supposedly “expelled” from his mosque. This turned out to the a faked video. He was not expelled. Read the correction I place above the video. This video is compelling and fascinating but fails to explain why so many Arab countries have supported authoritarian regimes for so long. The explanation given: “the narcissism of the leaders, evil of leaders, they are from military-authoritarian backgrounds, and the people are gullible and childish.” — may be apart of the story, but not the most important part. Patrick Seale comes the closest to raising the real causes of ongoing authoritarianism in the Middle East, but it is almost by mistake that al-Jazeera includes his analysis. The producers make no attempt to answer the hard and vital questions. Without dealing honestly with the failings of Middle Eastern nation states and societies, solutions to dictatorship will be elusive. Syrian mobilization against President Bashar al-Assad has followed a weekly cycle, with the biggest rallies taking place after Friday prayers. That may change during Ramadan, which starts next week. Activists, analysts and Syrian refugees say the uprising is set to intensify during the Muslim holy month. Opposition groups plan to shift from weekly rallies to nightly ones, held after the tarawih, an additional nighttime prayer recited during Ramadan, said Bashar Afandi and Mohammed al-Klesse, who fled Assad’s crackdown on northern Syria and are staying in Turkish camps. “The mosques will play a pivotal role and every night, when people gather to pray, will resemble what we have seen after every Friday prayers,” said Mahmoud Merhi, of the Arab Organization for Human Rights. A surge in arrests in the past two weeks is probably aimed at heading off the momentum that Ramadan may give to protesters, he said by phone from Damascus. Photo: Lee Smith. Najib Ghadbian, Associate Professor and author of The Second Assad Regime: Bashar of Lost Opportunities. Ahed Alhendi is a founding member of Syrian Youth for Justice. Radwan Ziadeh is the Founder and Director of the Damascus Center for Human Rights Studies. Abdul Razak Eid is co-founder of the Committees for Civil Societies in Syria. lawmakers on Capitol Hill that despite the repressive tactics used by Syrian President Bashar Assad, the Syrian opposition is starting to articulate an agenda for Syria’s future. “President Assad can delay or obstruct it but he cannot, however, stop it,” they testified. Najib Ghadbian, a member of the so-called Syrian Opposition Consultative Council, told London’s pan-Arab newspaper Asharq al-Awsat the anti-regime movement was preparing to take over the country following the collapse of Assad’s regime…. “The opposition is seeking to show the world’s leaders that there is an alternative to the Assad regime that is capable of filling the vacuum in the forthcoming stage,” Ghadbian was quoted as saying. Approximately 200 Syrian opposition activists met Wednesday in Istanbul for the first of four planned days of workshops intended to coordinate their efforts against the Syrian regime. The gathering, organized by Syrian Activists Network, is taking place in a hotel on the Asian side of the city. ….On Wednesday, the attendees consisted mostly of young adults, some of them from Syria. At the venue, their general mood was enthusiastic, with many expressing optimism they will achieve their goals. One young female activist, who comes from a long line of Syrian dissidents, said she was thankful for the opportunities presented at the gathering. “I want to attend the media course, I might attend the charity one, but I would be more than happy to join any of them,” she said…. “Some guy in Damascus” writes in the comment section on Thursday. Just passed by the muhkabarat head quarters in Kafer Suseh. I counted more than 30 buses…..looks like sh*t is going down tomorrow. DAMASCUS, July 29 (Xinhua) — Thousands of anti-government protestors poured down the streets in some Syrian cities Friday for a new round of protests. The state television said the protests erupted Friday in areas including the flashpoint cities of Homs and Hama and some suburbs of the northern city of Idleb. The private Sham FM radio said thousands of people staged a protest in Hama’s main Assi square. The state TV reporter in the southern city of Daraa, the epicenter of protests, disputed what al-Jazeera TV reported as large protests in the area and that Syrian security forces fired at demonstrators in the al-Sabeel neighborhood in Daraa. It showed live footage of the area which seems empty with no signs of protests. The TV said armed men are firing bullets and hand-made sticks of dynamite at the law-enforcement members in the coastal city of Latakia, injuring one. Meanwhile, al-Jazeera said a massive protest took place in the city’s main Assi square. Online footage showed a huge number of people gathered at the square, calling for the downfall of the leadership. According to activists, many anti-government protesters recently chose to hold overnight protests in several cities, aiming for a time when the security presence thins out. Abdul-Karim al-Rihawi, head of the Syrian League for Human Rights, told Xinhua earlier that security forces were conducting a “pre-emptive campaign” before the start of Muslims’ holy month of Ramadan, while some opposition parties said they would demonstrate daily during Ramadan to increase pressure on the government…..
BAGHDAD — At a roadside station here, where buses bound for Syria leave dozens of times a week, the space between two troubled nations is measured by notions of prosperity and security. … In Iraq, Syria still represents something of an oasis. Iraqis began to flee there years ago to escape the American-led war and the sectarian bloodletting that followed. Now, even as Syria faces its own turmoil, few Iraqis are returning home. In fact, the number of Iraqis leaving for Syria is far greater than the number coming back, said Brian C. Vaughan, assistant representative at the United Nations office. When balanced against Iraq’s continuing violence, its sporadic electricity that will only get less reliable as summer creeps on and an economy dominated by a corrupt public sector, Syria is seen as a better place to live. Ali, the barbar, heads for the relative security of Damascus. “You can relax there,” said Ali Mohammed, a barber, who left the Iraqi city of Najaf for Syria in 2005 after he was threatened again and again for cutting hair in a style that offended the version of Islam adhered to by the Mahdi Army, the militia that answers to the militant cleric Moktada al-Sadr. “You don’t need to worry about electricity, the heat” in Syria, Mr. Mohammed, wearing a skintight T-shirt and wraparound sunglasses, explained as he prepared to return to his adopted country after a visit with his family in Iraq. Bus drivers complain that the Syrian border guards often demand bribes, usually cash or gasoline, but they say that the political upheaval has not hampered business. Of course, many Iraqis traveling from Baghdad go straight to Damascus, the capital, not to regions north of Damascus that are the sites of many protests and the violent crackdown that has left nearly 1,500 people dead. But if prosperity and quality of life are measured in relative terms, that could explain why migrant workers from Bangladesh handle the luggage at the bus station here — searching for bombs before loading the bags into cargo holds — and serve chai to visitors. They came to Iraq, of all places, to seek a better life. One of them, Mamun Kalegagus, 25, said he had been working at the station, and living at its rudimentary quarters for immigrant workers, for two years. He is paid $12 to $15 a day, more than the $100 a month he earned cooking Chinese food back home. As Iraqis experience their own slow struggle for democracy and witness similar ones in Syria and other countries across the region, some have been inspired to nourish their own protest movement. Nearly every Friday, groups of demonstrators gather in Baghdad’s Tahrir Square. 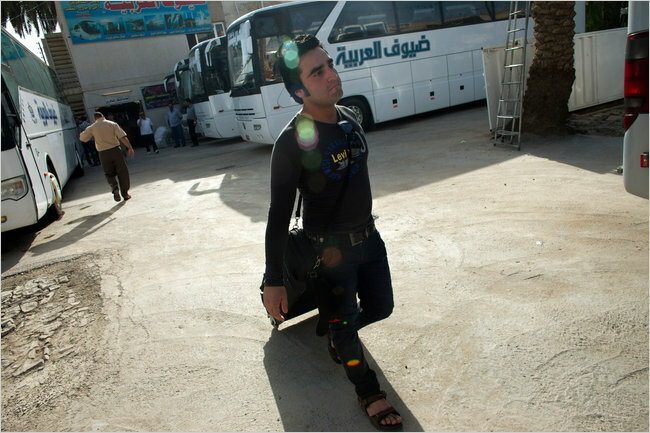 Other Iraqis, though, especially those travelers here at the bus station, are fatigued from their country’s years of war and failed promises of democracy. وقال بخيتان, في لقاء حواري مع قيادات حزبية في فرع دمشق وقيادات فروع النقابات إن “مؤتمر الحزب سيكون تاريخياً في حياة الحزب كونه سيسبق الانتخابات التشريعية التي نرى أنها لحظة مفصلية قادمة في حياة سورية، وسيخوضها الحزب لتأكيد دوره النضالي ومتابعة عمله في تحقيق المزيد من الإنجازات والمكتسبات للشعب”، لافتاً إلى أن “العديد من الملفات التي سيناقشها المؤتمر أصبحت جاهزة”. وتابع الأمين القطري المساعد أنه “من الجحود والنكران محاولة البعض تغييب الإنجازات الكبيرة التي حققها الحزب لجماهير العمال والفلاحين وباقي شرائح المجتمع خلال العقود الماضية، واقتصار حديثهم عن أخطاء ارتكبت هنا أو هناك من قيادات بعثية من دون الإشارة إلى الدور الكبير للحزب وتاريخه النضالي”. IDLEB, (SANA) – Over 11000 citizens have now returned to their towns and villages in the city of Jisr al-Shughour from the Turkish camps, who were forced to flee their homes by the armed terrorist groups, including the 358 returnees who came back over Tuesday and Wednesday through al-Hassanieh border point. “The truth was finally revealed to the city’s residents and it has now become hard to believe the lies about homes being destroyed and the absence of security which, we are sure now, are mere rumors and completely false and untrue,” said As’ad al-Bustani, one of the returnees, in a statement to SANA…. Dr. Subahi al-Hamdo, in charge of the popular committees coordinating the citizens’ return, said all the families who were in the Turkish Baqshin camp returned home, pointing out that the Turkish Red Crescent removed all the tents at the camp. He estimated the number of returnees till today at 11000 citizens. HOMS, (SANA) – Saboteur groups targeted on Friday’s dawn an oil pipeline near Tal Hosh Dam in Tal Kalakh with an explosive bomb, leaving a hole of 15-meter in diameter and causing oil leak. “At 04:00 am on Friday, some citizens heard an explosion near a pipeline for transporting crude oil to Banyias”, Governor of Homs, Ghassan Abdel al-Aal said in a statement to SANA Correspondent. The Governor added that the terrorist and sabotage act targets two vital sectors at the same time as the saboteurs chose a point near Tal Hosh Dam which irrigates large areas of the agricultural lands. The saboteurs committed their act with the intent to cause serious damages and losses through disrupting the irrigation operations and polluting the water of the dam and its channels, he said. Despite the Assad government’s bloody crackdown on demonstrators, U.S. officials have shied away from calling directly for his ouster. They worry that the United States would end up looking weak if Assad managed to hang on in the face of popular pressure. And with American leverage limited in Syria, they also have been reluctant to raise expectations about what the administration might be prepared to do to unseat the regime. At Wednesday’s hearing, an unusual coalition of Republican and Democratic members of a House Foreign Affairs subcommittee complained that the effort to calibrate a message had failed to make it clear that America stands with pro-reform protesters against an oppressive regime. “How many must die before we have the courage to stand up and say that Assad is illegitimate and he must go?” asked Rep. Steve Chabot (R-Ohio), the subcommittee’s chairman. He noted that the death toll in Syria over the last four months was more than 1,600. Rep. Gary Ackerman (DN.Y.) accused the administration of holding off on its strongest language until it was clear that Assad would fall. “We’re hedging our bets here on the odd chance that he’s going to be able to hang on,” Ackerman said. Paul Richter reporting. Al-Qaeda’s newly installed leader Ayman al-Zawahiri is claiming solidarity with Syria’s pro-democracy movement, telling protesters in a new video that they are part of a broader revolution to liberate Muslim lands. “The time of humiliation is gone, the time of deceit is over, and the rule of the thieves is finished,” said the Egyptian-born terrorist. A translation of his comments was provided by SITE Intelligence Group. Al-Qaeda has struggled to adapt to epic changes underway in the Middle East, as Arab populations have ignored the terrorist group’s recipe for violent jihad in favor of peaceful protests. In the weeks after the start of the Egyptian uprising, Zawahiri issued statements seeking to link the movement to al-Qaeda’s quest for a restored Islamic caliphate. “Washington today seeks to replace Assad, who sincerely protected the borders of the Zionist entity, with another regime that squanders your revolution and jihad in a new regime that follows America, takes care of Israel’s interests and grants the [Muslims] some freedoms,” he said. Local Coordination Committees in Syria (LCC) condemned the statement of the leader of Al-Qaeda Ayman Zawahiri and his interference in the Syrian revolution, while the Syrian regime is waging a fierce repression campaign targeting entire neighborhoods in Damascus and its suburbs and invading and besieging the revolutionist cities…..
Mohammad Al-Abdallah, the spokesman of Local Coordination Committees in Syria, said: “Zawahiri is trying to convince the world that he has supporters in Syria, which will provoke the international public opinion against us and give the regime the right to commit crimes against our people. We condemn such statements that are irrelevant to the revolution, Syrians chose the non-violent way for their revolution and they won’t change it, they refuse any practices or speeches containing sectarian or violent properties”. More than four months after protests began in Syria, Kurdish parties still do not have a clear agenda if the Baath regime falls. Some Kurdish politicians maintain the problem could be solved through a conference to unite the Kurdish front. Nuri Brimo, spokesman for the Kurdish Democratic Party in Syria, said Syrian Kurdish groups are debating whether to hold a Kurdish unity conference. The groups are divided over who should represent them in opposition conferences and have no clear agenda to push at the gatherings, Syrian Kurdish leaders say. Over the past few months the Syrian opposition has held several conferences in Turkey. The Kurds have always come out empty-handed, however. Most even withdrew from the most recent conference, held in Istanbul earlier this month, over concerns that their interests were not being represented. Radhwan Badini, a Syrian Kurdish leader who has attended three opposition conferences in Turkey, criticized Arab opposition groups for not sticking to the opposition’s agenda. “In most of the conference we agreed on one agenda with the Arab parties, but halfway through the conference they would switch their stance and stand against the Kurds,” Badini told Rudaw. Actor Qusai Khouli plays a resident of Damascus's slums in Birth from the Loins. The series was a clear condemnation of the hypocrisy of the Syrian upper class and gross abuses of power at a level that the audience could easily relate to and the censors could begrudgingly let pass. When anti-regime demonstrations broke out in Syria in March 2011, I remembered a quote from Samir: " You can have your revolutions, your socialism, and your rights - do whatever it is that you do. But in the end, everything will return to its natural state. It will always hold true: the son of the Pasha remains the son of the Pasha and the son of the maid will remain the son of the maid." DAMASCUS- In a statement published on Thursday, the National Evangelical Synod of Syria and Lebanon (NESSL) on Thursday condemned the killing, terrifying and sabotage acts committed by the terrorist groups in several Syrian cities, particularly the criminal acts against the army, police, law-enforcement, and security forces. The statement stressed that the Syrian people’s will for reform, which is among the characteristics of modern democratic and civil country where the citizens participate in making political and economic decisions. The NESSL called upon the Syrian people to be aware and united to prevent Syria’s enemies from taking this opportunity and achieve their ambitions. The NESSL warned that the popular demand for reform has changed into armed operations of extremist terrorist nature with the aim of undermining Syria’s stability. National Evangelical Synod of Syria and Lebanon (NESSL) expressed support to the reform program led by President Bashar al-Assad who seeks to build modern democratic Syria and preserve the national unity, denouncing all forms of foreign interference in Syria’s internal affairs. The statement called upon the churches worldwide to be objective in its view of what is happening in Syria, away from the biased media, and to request their leaders and politicians to support the Syrian people’s interest and not their owns. The statement sets a serious / dangerous precedent in the long history of Muslem-Christian peaceful co-existance in Syria. The Synod has moved from undeclared neutrality and support of peaceful change to unabashed support of the regime that was declared illegitimate by the demonstrators. By naming the alleged ”terrorist groups” as the source of violence in this uprising and failing to acknowledge Jr’s responsibility for the thousands of abductions, torture, and killing of men, women and children, the Synod has proven themselves as either notoriously misinformed or plain complacent. By supporting the aggressor in this crisis, the Synod will be viewed as a party to the ongoing aggression. Brazil, India and South Africa, which have blocked United Nations pressure on Syria’s government to end repression of protesters, will send envoys to Damascus to seek an end to the violence, according to South Africa’s ambassador to the UN. The three emerging political and economic powers, which in 2003 formed the coalition known as IBSA, plan to send deputy foreign ministers on the mission, according to South African Ambassador Baso Sangqu. “The goal is to engage Syria, understand where they are, and see if we can assist them to overcome the difficulties they have,” Sangqu said in an interview. The mission expects to be in Damascus soon, he said. As elected members of the UN Security Council, Brazil, India and South Africa have combined to put off action on a U.S. and European draft resolution condemning the Assad regime’s attacks on anti-government protesters. Western diplomats say that support from the three might dissuade China and Russia from vetoing it…..
Brazil, India and South Africa are aspiring permanent members of the Security Council that have reshaped the political dynamic in the UN’s principal policy making panel. The IBSA nations “reflect a view of the world that is different from the American and former colonialist European view, in that they are very prickly about developing-nation sovereignty,” Jeff Laurenti, UN analyst at the New York-based Century Foundation research group, said in an interview. Israeli occupation authorities prepare for building a cement wall in the occupied Syrian Golan to separate Majdal Shams town from the suburb of al-Oude and the liberated Ain al-Tinah site. …the four suspects — identified as Salim Jamil Ayyash, Mustafa Amine Badreddine, Hussein Hassan Oneissi and Assad Hassan Sabra. The men range in age from 36 to 50. It’s Friday again…it must be happy hour time for the Islamists. The level of violence by the “سلميا” phonies is growing by the day; blowing up oil pipelines, stabbing policemen, kidnapping officials, etc.. Their cover is blown now, and their support is dwindling, as would be expected. Their determination to control Syria or destroy it trying has exposed their ugly nature. 1) Lawrence Khalil, the world’s first Christian Salafi, apparently. 2) Three guys all called Mohamad Al-Haj. The security forces apparently didn’t know which Mohamad al-Haj they were after, so they arrested anyone with that name. Brilliant. 3) Omar Shaban and Omer Shaban…being one letter away from a guy who is wanted is, apparently, reason enough to fear for your life. Now that the Mubarak regime is gone, new sub-revolutions are erupting in Egypt. The Islamists no longer have any use for the secularists, who actually started the revolution and paid for it with their blood, so they are turning against them. The MBs and Salafists are now taking off their masks and exposing their true intention for Egypt, an Islamic republic with Shariaa law. The secularists may very well lose this fight, as they are outnumbered, unless the military intervenes which I think it will. The demonstrators – dominated by Muslim Brotherhood supporters – are calling for an Islamic state and Sharia law. Liberal groups first want guarantees of a constitution that will protect religious freedom and personal rights, whereas Islamists want speedy elections and a recognition of Islam – in one form or another – in the new Egyptian state. Although the Muslim Brotherhood – Egypt’s oldest political party – can turn out huge crowds by rallying its supporters at mosques, it does not necessarily represent the majority of Egyptians and is predicted to win around 20% of the vote in an election, our correspondent says. There was little sign of any secular groups at Friday’s rally, he says, adding that it will be interesting to see how they re-group after today’s events. Since early July, the mainly secular protesters had camped out in Tahrir Square – the epicentre of protests that toppled Mr Mubarak – to denounce the ruling military council over the slow pace of reform. Islamist groups had for the most part stayed away from the sit-in. Last week, they held their own demonstration and accused the Tahrir protesters of going against the country’s “Islamic identity”, the AFP news agency reports. But with Islamists and the more conservative Salafist groups now filling Tahrir Square, it could mark a turning point in Egypt’s post-revolution period, our correspondent says. Liberal parties endorse the measure in an effort to limit what they fear will be outsized Islamist influence on the new document should religious groups win a large share of the parliament. The Supreme Council of the Armed Forces has accepted the idea. Islamists oppose it, saying nothing should restrict the right of the new elected parliament to oversee the process of drafting the document. While opposing the measure, Muslim Brotherhood members did not press the issue Friday due to an agreement between organizers to avoid divisive issues. Crowds of ultraconservative Salafis, however, gave a common protests chant an Islamic twist — sparking criticisms from others who said the chants violated an agreement to avoid divisive issues. Instead of “Peaceful, peaceful,” which demonstrators have chanted during confrontations with security forces, they repeated “Islamic, Islamic.” And instead of “The people want to topple the regime” — a chant made famous in Tunisia and adopted across the region — they yelled, “The people want to implement Sharia,” or Islamic law. Salafis are ultraconservatives, close to Saudi Arabia’s Wahhabi interpretation of Islam and more radical than the Brotherhood. They seek to emulate the austerity of Islam’s early days and oppose a wide range of practices like intermingling of the sexes that they view as “un-Islamic.” Many also reject all forms of Western cultural influence. Violence broke out elsewhere in Egypt. Gunmen fired on a car carrying five Christians in the province of Minya south of Cairo, killing two and injuring two, a military official said. It was the second killing in two weeks in the predominantly Christian village of Roman. Christian residents gathered in front of the hospital where the bodies were taken as the word spread, although the official said the attackers had not been captured and the reason for the shooting was not known. In the Sinai city of al-Arish, hard-line Salafis fired rocket-propelled grenades and other heavy weapons in the air during protests, injuring a small boy, according to an intelligence official. Both officials spoke on condition of anonymity because they weren’t authorized to brief the media. In the southern city of Assiut, deputy police chief Yosri el-Jammasi said Salafist protesters beat up a group of protesters from the Communist party trying to join their demonstration. At one point, some in the crowd yelled back at a speaker who criticized the idea of constitutional guidelines. All protesters agree on a number of other key demands, including the end of military trials for civilians, a clear schedule for the transition to civilian rule and swift trials for former regime officials and those accused of killing protesters during the uprising, which left about 850 people dead. The rally comes a day after Egypt’s Justice Ministry said Mubarak, along with his two sons, his former security chief and seven others, will be tried at a Cairo convention center. Of the 11, Mubarak, his security chief — former Interior Minister Habib el-Adly — and six top police officers are charged with ordering the use of deadly force against protesters. If convicted, the eight could face the death penalty. Mubarak, his sons Gamal and Alaa and businessman Hussein Salem also face corruption charges. Salem, a close friend of Mubarak’s, is at large. The announcement had little apparent effect on Friday’s protest, mostly because most activists doubt Mubarak will actually stand trial Wednesday as planned. Mubarak’s lawyer and doctors treating him in the Red Sea resort of Sharm el-Sheikh have repeatedly reported that the 83-year-old ousted leader’s health is failing, though Egypt’s health ministry said he is fit enough to stand trial. 2009 !!!! US conspiracy !!! Who will believe it ? If revolutionary demonstrations in Syria usher in a new era of political and social change, then the musalselat of 2011 might be looked back on as the last dramas that had to issue guarded social critiques. On the other hand, with so many Gulf companies buying up Syrian dramas and censoring them for domestic consumption, it is likely that the obstacles to musalselat production will keep on going. I don’t mind spelling mistakes either. Mnhebaks are boring me to death. Your posts sometimes are the only highlights of the whole page. Keep posting. Who do YOU think killed Harriri? HA, Syria, Israel, an ex-wife? I won’t be offended if you don’t answer. I know “talking” is not your thing. You are right, in Egypt the Secularists started the whole thing against Mubarak’s regime and the Islamists jumped on the bandwagon and now call for a Muslim State disregarding all of the others. The Islamists of Egypt, with the help of the money of the Gulf States are now going to take over sooner or later. The money of these states is not used to promote economic development or education as we can see. The money of the Gulf states is what bringing us all of the cartoonish characters we see and hear about and who are now trying to control the uprisings against the authoritarian rulers of the Middle east. The Islamists of the Middle East has an agenda and it looks like it. This agenda calls for a total redrawing of the area’s borders and map. It is obvious. The Gulf countries should be careful because their rule is autocratic and fragile. The ideas of social justice that are taking the airwaves are going to reach them sooner or later. Plus, if you put on top of the ideas for change the religious sectarian combative tone they are helping through the TV stations like Wisal and Safa, one can see nothing but trouble for all of the Middle East. The only way to curb violence and upheavals is through SECULARISM and DEMOCRACY. Iraq is not Syria, and if the US would not have entered Iraq Iraqis would have been out today demonstrating against Saddam. And completely closed dictatorship IS what brings dangerous islamists, an open democratic society where you can argue and build a civil society and discuss openly is the only protection possible, the problem with terrorist dictators like in Syria is that they spread their corruption and violence to other countries and weaken democracy and institutions there (example here:http://bit.ly/nTBFsA ), thus they are actually who destabilize the region and create situation that give birth to islamist terrorists. All are slightly different from Mohamad Al-Haj . Looks to me your list has triplicated names ( and more features ) to make it larger. You are excused as you are Homsi and not Aleppine . @13 But you proved my point entirely. The people doing the arrests did not know, nor did they care to know, the middle names of the people they were arresting. Each one of these individuals had the first name Mohamad, and last name Al-Haj. Where on Earth did you come up with the family name Den Al-Haj? That’s quite absurd. But Ala Al-Den is of course a middle name. Honestly, the menhebaks need to ask themselves, if nothing is going on in Aleppo, why are there so many arrests there? i truly believe the regime has given hope in the rest of Syria. they are now focusing on keeping us (Damascenes) silent. they know that When Damascus rises it is truly the death knell for the regime. the ring around Damascus is on fire. and on Thursday checkpoints are placed on all city entrances. will the Ramadan boost get Damascus up? that is what we have to look out for now…i don’t know about Aleppo but the some major anti-demonstration occurring in abasiyeen square or bab msalla square is a reality that keeps the regime up at night. I’m looking forward to chapter 4: Tara & The Angel..
Aboud’s list of Aleppo posted by “As’ad AbuKhalil” is phony ! @18 Hehehe, who do you think gave the list to Professor Abu Khalil? And it’s not fake, no matter how much you’d earnestly wish it to be. It is a testament to the complete and utter incompetence of the security forces. Someone obviously needs the attention. The BBC is reporting “large” protests. I wonder if SANA is reporting the same thing? A major defection has taken place and a significant move twords the formation of the Future Syrian Army has been announced; The announcement of the formation of the Free Syrian Army (FSA) in the presence of seven defecting officers. They named several of their units after martyrs of the Syrian revolution. To work with the people to down the system. CAIRO (Reuters) – More than 30 political parties and movements withdrew from a rally on Friday that was organized to send a united message to the ruling army about reform, saying the event was hijacked by Islamist groups. “Islamic law above the constitution,” read banners in Cairo’s Tahrir Square that was packed with tens of thousands of people. Protesters who fear Islamists will seek to dominate plans to rewrite the constitution demanded they be taken down. “Islamic, Islamic, we don’t want secular,” they chanted in the square filled with many followers of the strict Salafist interpretation of Islam. “There are so many (Islamic) beards. We certainly feel imposed upon,” said student Samy Ali, 23. He said Salafists had tried to separate women and men camping there. Liberal groups fear the Muslim Brotherhood, Egypt’s best organized group, and other Islamists will dominate the vote. When those who are supposed to protect you, your family and your country have to dig the garbage containers for leftovers, be very very afraid. Yet another phony video from Youtube !! Not even sure of the name of the free future syrian army. Last night Alaaroor angel appeared to joshua while he was sleeping in his home in Oklahoma. Alaaroor:So you are the famous Joshua Landis. Joshua:yes sir.can i help you. A:of course you can.listen i am so mad of you. A:you could not find a moslem girl to mary.why did you have to mary an Alawi? J:but sir i thought an Alawi is moslem. A:in your dream yanke boy.not in my dictionary. J:ok whatever you want. i did not know. A:listen did you hear about my grinding machine? J:for god sake,why do you talk about it ,that is for syrians.I am an american. A:shut up yanke boy. did you hear about the new citizenship law which bashar passed? A:that grants you citizenship from your wife.any way,your wife is qualified for my machine being Alawi,you dont want your wife to go in my machine by herself.do you? J:i mean i love my wife,but i am not i fan of your machine.you dont think that my country will let you put me in that machine. A:hahah..i hate you and i hate America and especially mobarak hussien. A:exactly,the ediot has made himself a christian,what a shame.i think i will put him in my machine too.God and shiek binladen talk about barak and bush all the time,i think binladen is trying to have every one ther dislike barak. J:Why are so much hatefull,chill down. A:listen yanke boy,i am so mad of you,you are running SC right? A:listen i want your site to be completely with the revolution or else you blame only yourself. J:shiek,i am an academic person. A:will you are making me really mad,Let me put my machine on. Then joshua’s wife walk up hearing him saying that.she asked what is wrong? he said nothing thank god you are ok.
HSyrian doesn’t believe anything that doesn’t come from SANA, and will fall for everything that comes from SANA. He probably doesn’t even know that there was a defection in Abukamal two weeks ago. Junior will be on the plane to Tehran, and some clueless people will be getting ready to go out to the menhebak demo, that SANA said was being held in the last tiny patch of land that can still stomach his pictures. And you misspelled “idiot”. How…ironic. You know, I find it troubling that it’s always the menhebaks who seem to bring up the issue of who professor Landis married. But at least it shows that the professor has excellent taste, Syrian women are the HAWTESS! i have not met a single dissident that supports 3ar3oor. personally i dont know what he even looks like. the last time the muslim brotherhood was in the syrian parliament they only had 3-6% of parliament. snk, syria has a proud history when it comes to a secular society. let me start by reminding you how muslims in Damascus welcomed christian refugees into their homes during the طوشة النصارة . now you tell me, whats the limit of freedom in syria? SGID @ 27, neither have I. Ar’or is to the Baathists what Salman Rushdie was to the Iranians. The menhebaks have made the satellite shiekh more prominent that he ever could be. Heck, half his viewership is probably this bunch right here, waiting to see what he’s going to say next. SNK wakes up in his parent’s basement, the sword of Ar’or over his head. SNK: Nooooooo! Sbare me buhlease! Buhlease don’t kill me! Ar’or: Kill you sonny? *cackle* Hell boy, I’m gonna give you a great big kiss. Ar’or: Damn right son. Thanks to you and the rest of the Bashar lovers, I’ve gotten more notoriety these past four months than I did in 30 years. Yeeeeehaaaaa! Keep up the good work. Just put your eyeglasses and look on Egypt or iraq..you don’t have to look 100 years ago . 40 years ago we had Amkalthoum,now we have Haifa wahbi…things change. new terms have resurfaced in the syrian vocabulary: اصلاح, حوار they were never available before. the foreign minister announced hes erasing Europe off the map: he forgets about the funding the EU has provided, or even where hes going to get his next bmw from. people have forgotten the basis of what is a state and what is a government, maybe we should remind them that it is the president serves the people and not the people that serve him. lots of people complain that there is no other option than bisho, let me remind them that it is also bisho that doesnt allow any alternative to take shape. snk please tell me: do you honestly think bashar is a good president? ‘Peaceful activists’ ,attacked Syrian Arab airline’s office in London . كشفت السفارة السورية في لندن أن عدد من الشبان السوريين اعتدوا يوم الخميس على مكتب السورية للطيران في العاصمة البريطانية, وسحبوا صورة الرئيس بشار الأسد الموجودة في المكتب وهشموها, فضلا عن الشتائم التي وجهوها لموظفي الشركة الوطنية, الأمر الذي أثار استنكارا شديدا من قبل السفارة, واصفة هذا العمل بالتخريبي. وقالت السفارة السورية في لندن ,في بيان صادر عن المكتب الإعلامي تلقت سيريانيوز نسخة منه , إن” مجموعة من الشبان السوريين اقتحموا مكتب السورية للطيران في العاصمة لندن, ثم قاموا بسحب صورة الرئيس الموجودة بمكتب طيران الناقل الوطني للجمهورية العربية السورية وتهشيمها ,و تصوير هذا العمل على الهواتف النقالة من أجل استخدامها لاحقاً في حملة تشويه سورية الجارية على قدم و ساق, بالإضافة للاعتداء اللفظي على موظفي الشركة الوطنية”. وأثار قيام الشبان السوريين بالاعتداء على مكتب السورية للطيران في العاصمة البريطانية استنكارا شديدا من قبل السفارة السورية في لندن, واصفة هذا العمل بالتخريبي , مبدية في الوقت ذاته استغرابها من قيام أي شاب سوري الجنسية بالاعتداء على مكتب الناقل الوطني لبلاده و رموز بلاده الوطنية بهذه الطريقة الهمجية. وكانت العاصمة البريطانية لندن شهدت مؤخرا تظاهرات احتجاجية مناهضة للنظام, وأخرى مؤيدة داعمة للرئيس بشار الأسد ولبرنامجه الإصلاحي, على غرار عدة عواصم أخرى. ولا تزال عدة مدن في سورية تشهد تظاهرات احتجاجية منذ أكثر من 4 أشهر, تطالب بحريات عامة وتطلق شعارات سياسية مناهضة للنظام , أسفرت عن استشهاد المئات من المتظاهرين المدنيين وعناصر الأمن والجيش, حملت الحكومة مسؤولية هذا الأمر لمجموعات مسلحة , في حين يتهم حقوقيون ونشطاء قوات الأمن بقتل المتظاهرين واعتقال العديد منهم لقمع الاحتجاجات. What kind of a question is that “do you honestly think bashar is a good president?”. Whether he’s doing a good job or not is not even open for debate. Of course he’s doing a HISTORICAL job, in fact out of 25 million Syrians, he’s the only one capable of being president. In all honesty he’s such a great guy other nations are conspiring against Syria out of pure jealousy for having such a handsome wonderful young man in charge (an exact quote of a regime trumpet). a more appropriate question is, how much do you LOVE Bashar on a scale of 9.9 to 10 ?. Fascinating. I am studying the mnhebak phenomena. Quite intriguing. Do you remember which regime trumpet said that? The Arabs have military-political juntas. We in Israel suffer from economic-political junta. “Israel is doing well”, depends on how you define well. Yes, the economy is growing, the GDP + per capita are improving, so how come the people don’t enjoy all that? The answer is, that we become a little America, where very few have much much more than they need, while the overwhelming majority has not enough. There are 18 rich families (Aka the Israeli junta / oligarchy) who control all aspects of the economy and of the politics. We have to decapitate them. Then, Israel can become a mini Scandinavia. It is with disgust I read your post, will they be as appalled if the young Syrian men stormed the office and hugged Assad jr. portrait? One of our finest musicians, nationally and internationally, Malek Jandali, whom resides in the States. His parents were paid a visit by no other than Assad’s security forces. They left the house after insulting his elderly father and mother and left the home in the same despicable manner, as when the IDF storm the homes of Palestinians. His parents were left locked in their bathroom. The Jandali’s crime is guilt by association. The same as any Palestinian family in Occupied Palestine. Their children, Syrian and Palestinians are saying, enough oppression, subjugation and humiliation. Do they ever get it. Similarly, they are supporters on both side who see their future without a dictatorship and without occupation, a recipe for disaster. If Syrians mean to you anything, and if you and your likes are truly scared Islamic rule, it is incumbent on your likes to join forces with our most courageous men and women. One people, one voice, and say NO to tyranny. Or you have an option, SPARE US THE CLAMOUR and stay silent. Silence is sound, especially when people are demanding a better future selflessly. And you know it as much as I do. Yes, but the defense budget is only around 15% of the budget cake. On the other hand, the median age in the Scandinavia’s is around 40, while in Israel, it’s closer to 30. Those 10 years difference are being translated to huge expenses on taking care of the elderly, and so on. Israel has the potential of becoming a real welfare state. A political decision is needed. What is worse, Bashar wasn’t even supposed to be Dictator. His older brother died in an auto accident and everyone had to move up one place in line and so, Bashar became an accidental dictator. Am I the only one who gets the impression that Ghandi could be president of Syria, with Mother Teresa as VP, and Dale Andersen would still hate Syrians? “Journalist Alexander Page, who said he was with protesters who were marching from Damascus’ Midan neighborhood to Zahera, reported that he saw three people shot when security forces aimed into the crowd and fired. Four buses carrying “regime thugs and riot police” had arrived on the scene, and security forces were stopping cars and beating people, Page said. The wounded were picked up by security forces and taken away in buses, Page said. #37 You beat me to it NZ, but let me give the story again with the clear reason for the criminal and totally illegal behavior towards the Jandali family by the goons who have been terrorizing Syria for the last 40 years: Mr Jandali’s parents were attacked and the contents of their house vandalized ONLY because their son PARTICIPATED in a rally in Washington D.C. calling for freedom and democracy in Syria. قامت قوات الأمن بالتعاون مع الشبيحة باقتحام منزل الدكتور مأمون الجندلي وزوجته مساء أمس وذلك بعد عودتهم الى المنزل. إلى أن انتهوا من تكسير أثاث المنزل بشكل كامل، ونهب مااستطاعوا نهبه. وبعد أن حولوا المنزل إلى “خرابة” قاموا بشتم الطبيب وزوجته والموسيقار العالمي مالك بأقذع الألفاظ وهددوهم أيضاً. وغادروا المنزل مع مفتاح باب الحمّام المقفل على والدي مالك، ولولا أن الطبيب مأمون قد احتفظ بهاتفه الخليوي واتصل بأحد الأقارب لفتح الباب لبقيا هناك حتى الصباح!. 20 more terrorists killed today in Syria. I’m confused, is it Hezbollah, Hamas or al-Queda? I can’t tell one jihadist from the other. We have to decapitate them. relax it was not me who wrote the article ,it was Syria News ,i hope you felt disgusted as well by reading that some Syrians in London attacking their own national air line office and verbally abusing its employees ,the name is ‘Syrian Arab air lines’ ,its not even a government building its not a prison its not Al Baath headquarter . No to Tyranny, no for power monopoly, no for article 8 and 3 ,(I actually don’t like the entire constitution we need to change it) no for corruption ,no for favouritism ..no for all this and that how can I disagree with this, but also NO for terrorism, NO for revenge, no forever to Bashar .and NO for replacing dictatorship with another one worse ,and no for sectarianism. Is that the better future? Are you intending when you remove Bashar to silence all voices that you don’t agree with? Where is freedom of speech? See ,if I have faith in this uprising as its for better future ,I would at least keep silent and spare you my voice ,but unfortunately ,I see it for much worse future than what we could see in our wildest imagination, I was silent till this uprising called me the ‘silent majority’ ,so I decided to speak up . PS,its not the islamists I am scared of only ,it’s the civil war ,how cant you see it coming NK? My thanks to HSYRIAN #7. It reminds me one more time why I shouldn’t revisit this blog. Pro-regime rally 28 July 2011 in Aleppo. The festive, happy atmosphere in the crowd can be interpreted as an indication that the crowd believes that the Assad regime is securely victorious in Syria and stronger than ever before (a belief which is true and correct as far as I can see myself). The Arab awakening video above was really a fascinating watch. The most striking aspect to me was what I perceived as melancholic music starting at 24:52. It threw me into a very sad mood. Why us? Why the Arabs? Hafez Assas ruled his regime by “I am faithful to you, you be faithful to me” …. Tlass remained the minister of defense for ages. The dictators always use the line ” we can give you security, stability OR chaos. They often use Islamists to secure their power. The dictators are always careful not to come across as an absolute monsters. As much as they need to be feared, they hope to be loved. They infantilized their people. They make their people into these little children and of course they are going to stay children. And as long as you don’t misbehave you won’t get beaten, arrested or tortured. “My people, they all love me” and any one who doesn’t must be an agent of Al-Qaeda or the west because it may be inconceivable for them to believe other wise. A dictator can be psychologically in touch with reality, by psychological testing, but politically out of touch with reality by surrounding himself with a group of sycophants who are afraid for good reasons and tell him what he wants to hear rather than what he needs to hear. The dictator comes to believe that only him can bring the country forward and no one else can tell him anything. They believe their people love them, but just in case that the professed love is not real, it is best to know what they are up to all the time, therefore: Every one has to survey on each other. It is necessary to have multiple separate conflicting security agencies not to be on good term with each others-they all report directly to the president. People can no longer trust their neighbors or friends, as they may be government informants creating very paralyzingly climate…. The political leaders are to some extent enslaved by their security chiefs. Everyone around the dictator becomes sycophant for fear of their life so autocrats risk the ignorance that comes with isolation. Absolute power requires absolute control of all media. You met educated people in Cairo who read Ahram newspaper because they believed it or because they wanted to believe it. (Remember mnhebaks favorite articles come from SANA.) This is part of INFANTILiZATION of the society. There come a point when so much has been taken from the people that they no longer has anything more to lose. OMG. How did I miss that dude when I lived in Syria? I would’ve killed my self…from admiration that is…. You are talking too much about the angel coming into everyone’s dream, I am now afraid to sleep. I believe you mistook me for N.Z. we’re two different individuals, no hard feelings though ^^. Nonetheless if you felt in anyway offended by something I wrote, I apologize, it was not my intent. regarding the attack on the Syrian Airlines in London, I read the post on Syrian-news but they don’t really say much about what happened, was it an act of vandalism (زعرنة) or did the employees provoke the activists ? either way it’s not something that deserve getting worked up about, as I understand no one was hurt, and no real damage was done, except for the destruction of one portrait of the eternal leader. Such an incident is trivial in comparison to the atrocities the Syrian regime is committing against the activists in Syria. Is civil war really that big of a threat ? after thousands of deaths among activists over 5 months all I will say لو بدا تمطر كانت غيمت , those demonstrating proved again and again that blood and revenge is the last thing on their minds (with the exception to the few incidents here and there that don’t represent the majority). Syria ranked second in the 23rd International Olympiad in Informatics (IOI), held in Thailand on July 22-29, for the first time in the history of its participation consecutively. Kinan Sarmini won the silver medal after getting 454 points out of 600 points in the 2-day competitions which included 307contestants from 79 countries. Deputy Head of the Syrian Computer Society (SCS), Jaafar al-Khayyer, told SANA that the Syrian team included three contestants beside Sarmini. Sarmini already won the bronze medal in the 22nd Olympiad competition held last year in Waterloo, Canada. You can always revisit the comment section of this blog to get MY daily dose of vaccine against germs !! Further to my post above, and this is addressed in all seriousness and sincerity to Louai, Jabali and all the other seemingly reasonable and Syria loving people out there. If democracy and freedom and secularism are your aims and if you really care about and love Syria then why don’t we all join together to make sure that this uprising is not hijacked by Islamists or other non-democratic forces, that it is steered towards a liberal, secular state that guards the rights of all? The more fear you/we plant in people’s hearts and minds of what may follow the easier it will make it for the current undemocratic, oppressive tyranny to survive. I like your psychological analysis of tyrants, but you forgot to also mention that some allow a certain percentage of the people to benefit greatly from their rule and who would be at great risk if it were to collapse. This is the case in our unfortunate country, for even if Bashar were to have a divine revelation and try to deliver what the people wanted, there are those around him with the power to have his head on a platter quicker than it takes for him to say “I quit”. Very valid point. This is what alot of people at first thought was happening, and, as the article by Emma Sky illustrates, is the excuse many of the supposedly pro-regime crowd are giving themselves to justify their support to junior. But the fact is, the man has shown he cannot lead. If he is a prisoner of the system, then he is as useless to the country as if he were a strong-man dictator like his father. He cannot keep commitments, he has no authority to cut deals. Then let the regime put forward someone else in his place who can. It is precisely what we are all fearful of. And how easy to ignite one! The opposition as far as we know is as colourful as our national fabric. Speaking up against the protesters, yet insisting on a Syria free of tyrany…..Do you think is there is a contradiction between your aspirations and actions. It is precisely what I cannot comprehend, and I do thank you for you candour. Thousands of lives have been shattered, will you want them to stop, now? If so when is a good time for change. The vampires can no longer be allowed to roam freely, they need to be tamed and brought back to civility, where the rule of law and not the rule of the jungle prevails. Change will only be easier with unity. Till then…let us see how we can make our aspirations inline with our actions. Let us try to see how we can all gravitate in one direction towards the same goal. “The more fear you/we plant in people’s hearts and minds of what may follow the easier it will make it for the current undemocratic, oppressive tyranny to survive.” RIGHT ON !!!!!!! This is precisely where my frustration with the other side, the majority on this blog have a sincere love for the people and the country. But how can we narrow the gap between the two approaches? I think we are getting closer, we have no choice. قال أستاذ القانون الدولي في جامعة جورج تاون داود خير الله في حديث لقناة “روسيا اليوم” في 29 يوليو/تموز إن الثورات العربية بدأت بدون أية خلفية فكرية، مشيرا إلى أن الإخوان المسلمين والسلفيين وغيرهم من أنصار التيار الديني هم الوحيدين المنظَّمين من الثوار العرب. ورأى خير الله أن الإرادات الخارجية التي لها مصلحة في تغيير اتجاه هذه الثورات تجعل من بعض الأحزاب الدينية أدوات تمزيق داخلي. وأشار إلى أن هذه الجهات الخارجية هي بالتحديد الولايات المتحدة ةبعض الدول الأوروبية الصديقة لإسرائيل التي لا تريد أن ترى تغييرا أساسيا في النظام المصري وغيرها، على سبيل المثال. واعتقد خير الله أن الوضع في سورية مماثل إذ أنها أيضا تشهد نوعا من محاولة استغلال التجمعات الدينية لتمزيق الصف الداخلي. ورأى أن معظم سكان المدن السورية ليسوا على اقتناع بأن هذا المسار يؤدي إلى الإصلاح المرجو. وأشار إلى وجود بعض الاتجاهات في الولايات المتحدة وفي الغرب التي ترغب في تغيير النظام السوري من حيث موقفه من المقاومة للاحتلال الإسرائيلي للأراضي العربية. وقال: “لا أعتقد أن الهم في أمريكا أن يروا ديموقراطية في أي بلد عربي. ليس في مصلحة الغرب الديموقراطية في أي بلد عربي لأن المصلحة الأمريكية ارتهنت بالمصلحة الإسرائيلية، وتظهر ذلك بكل مواقفها”. وشدد خير الله على أنه “إذا اختار شعب عربي من يمثل مصالحه فستصطدم هذه المصالح بالمصالح الإسرائيلية، وبالتالي بالمصالح الأمريكية”. وواصل ان “الدليل على ذلك ان حلفاء الولايات المتحدة الذين كانوا والذين لا يزالون بإعلامهم وأموالهم يعملون لعملية التغيير في العالم العربي ليسوا مثالا في الديموقراطية ومحاربة الفساد وحكم القانون والحريات العامة”. وأكد خير الله على أن للغرب مصلحة في السيطرة على عملية التغيير في ليبيا أيضا، وأن يكون أكيدا من الذي سوف يحل محل القذافي. وقال: “لا أعتقد أن الحل الخارجي سوف يوصل أي دولة عربية إلى بر الآمان. المستقبل الذي يصنعه الآخرون هو في مصلحتهم وليس في مصلحة الدول العربية”. You said: “Further to my post above, and this is addressed in all seriousness and sincerity to Louai, Jabali and all the other seemingly reasonable and Syria loving people out there. Mr. MGB how do you propose to prevent the Islamists from highjacking this situation? Look at Egypt, any plans? As for joining forces, I would love to join a legitimate secular/liberal party, where is that party? Any day mr. MGB I will join anyone who is for human rights,the modern law that equals all, democracy, and the separation of religion from state. The fear we/the ones trying to be factual/ are planting is the hearts and minds of people is a legit one. There is a civil war on the horizon and more violent clashes are on the horizon. AS you see there are a new Army in Syria. We need political parties, new ones, and not new armies. AS for the undemocratic regime now, look it promised to do things in September and now things are put off till the end of the year, so in my opinion the future does not look good unless smart and unbiased people start taking over and cool things down. Start the political parties process as soon as possible. Do not forget the SECULAR party please.